A higher share of foreign students and exchange visitors than international tourists or business travelers overstayed their permission to be in the U.S. last year, according to a new Department of Homeland Security report. Overall, about 629,000 foreign visitors who were expected to leave the country in fiscal 2016 were still in the U.S. when the fiscal year ended Sept. 30, out of about 50 million arrivals by air and sea. The number and share of foreign visitors who become unauthorized immigrants by overstaying their permission to be in the U.S. vary widely by visa type and by home country. Among all foreign visitors covered by the report, the overstay rate at the end of the 2016 fiscal year was 1.25%. 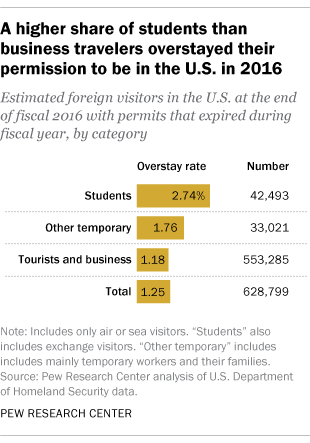 The overstay rate was 2.74% for student and exchange visitors, meaning that about 42,000 were suspected to be still in the U.S. among the 1.5 million who were expected to leave in that year. Among the 47 million business and pleasure travelers due to leave, the rate was lower (1.18%) but the overstay number was higher (553,000). The agency also reported data for a category that included mainly temporary workers and their families. Among the 1.9 million people in this category expected to leave in fiscal 2016, about 33,000 were still in the U.S. as of Sept. 30, a 1.76% overstay rate. 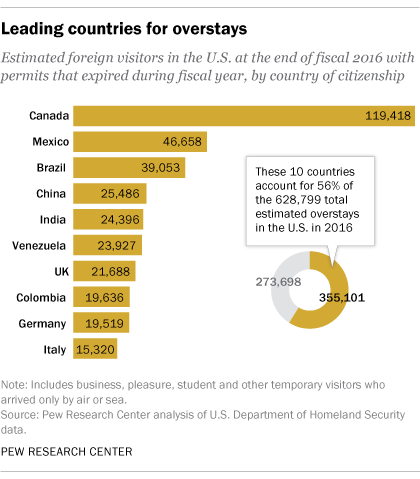 The largest number of overstayers came from Canada (about 119,000, a 1.3% overstay rate), followed by Mexico (about 47,000, a 1.5% overstay rate) and Brazil (39,000, a 1.8% overstay rate). As a group, countries with visa-waiver programs (such as the United Kingdom or Spain), where the U.S. does not require a visa for temporary visits, had lower overstay rates than Canada, Mexico and countries without visa-waiver programs. Countries with the highest overstay rates tended to send smaller numbers of visitors. For example, 47% of students and exchange visitors from Burkina Faso who were supposed to leave in fiscal 2016 were still in the U.S. at the end of the fiscal year, or 327 out of 699 people. Congress has been pressing the government for well over a decade to improve tracking of foreign visitors who overstay their deadlines to leave, in part because some of the plane hijackers on Sept. 11, 2001, were foreigners on expired visas. Another reason for the growing focus on overstays is that they may be a growing share of the nation’s unauthorized immigrant population: Decreased border apprehensions and other data point to a declining inflow of people crossing the border illegally. The agency’s snapshot of foreign visitors who overstay their deadlines to leave differs from a portrait of the overall U.S. unauthorized-immigrant population of 11 million in 2015, derived from Pew Research Center estimates. Mexicans accounted for about half of the nation’s unauthorized immigrants that year, but they were just 7% of fiscal 2016 overstayers who had arrived by air and sea. Canadians, who accounted for 19% of fiscal 2016 overstayers who had arrived by air and sea, were about 1% of all unauthorized immigrants in 2014, according to the latest Center estimate. Looking at changes from 2015 to 2016, the numbers of tourists or business travelers who overstayed their permission to be in the U.S. and were in the country at the end of the fiscal year rose by about 71,000, or 15%. The number of people who overstayed rose for all regions of the world. In both fiscal years, the number of people who overstayed declined after the fiscal year ended because some left the country. The report said about 545,000 overstayers from fiscal 2016 were still in the U.S. in January 2017. The number of fiscal 2016 overstayers currently is estimated to be about 455,000, compared with 629,000 at the end of the fiscal year last fall, DHS official John Wagner told a House Homeland Security Committee hearing on May 23. The number of fiscal 2015 overstayers was 355,000 in June 2016, down from 429,000 the previous fall. The government’s data on foreign visitors who leave the U.S. by air or sea comes from commercial airlines and passenger vessel manifests, but is not always accurate, according to a recent audit report by DHS’s inspector general’s office. DHS Inspector General John Roth said in the May 23 hearing that passenger manifests can be up to 95% accurate, but there are errors in both directions: People can falsely be listed as departed or not included on the list of departures. Congress has been pushing DHS to collect biometric data such as fingerprints or iris scans to ensure better exit information, and the agency has been doing so on a trial basis. Last week, U.S. Customs and Border Protection announced it has updated its website to allow some foreign visitors to check the status of their stay and see how many days they have remaining. 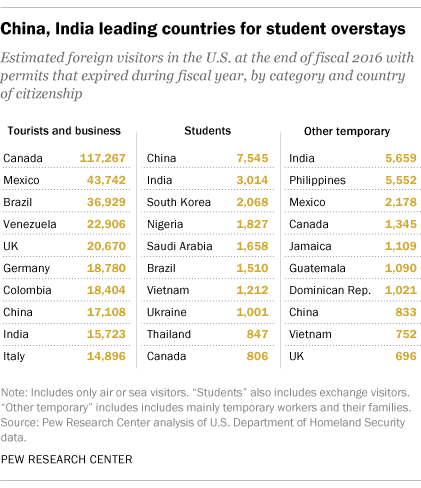 Compared with data about tourists or business travelers, records for foreign students, exchange visitors and temporary workers are more challenging to track, because many seek to extend their permission to stay or switch to a longer-term or permanent visa. Students may be admitted for a certain period, or for the duration of a program without a set timeframe. Data on foreign students relies heavily on schools, which report the information into the Student and Exchange Visitor Information database. The largest number of fiscal 2016 student and exchange visitor overstayers came from China (about 8,000), followed by India (3,000) and South Korea (2,000). In the category that mainly includes temporary workers, the countries with the largest number of overstayers were India (about 6,000), the Philippines (6,000) and Mexico (2,000). In addition to potential accuracy issues caused by faulty federal records or third-party data, the government’s overstay methodology and reported results have other potential weaknesses. The 50 million admissions counted in fiscal 2016 include some people who came to the U.S. more than once, for example, but the overstay number counts each person only once. If each visitor were counted only once, the admissions figure likely would be smaller than 50 million and the overstay rate would be larger than the one in the DHS report. 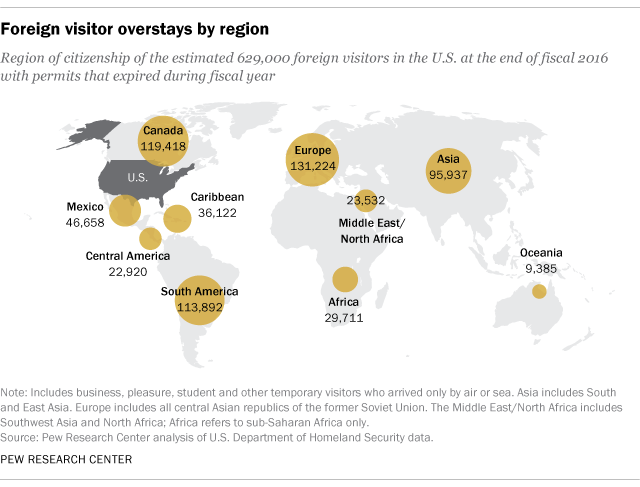 Correction: A previous version of the map “Foreign visitor overstays by region” included incorrect numbers for Africa and the Middle East/North Africa. The map was replaced on Oct. 18, 2017.